At an estimated 3.3 million, Muslim Americans represent a small portion of the American population. But the community could play an important role in so-called swing states during the upcoming presidential elections. When the Council on American-Islamic Relations (CAIR), a Washington-based rights organization, launched its 2016 Muslims Vote campaign, the goal was to lead 1 million Muslim constituents to the voting booths. Robert McCaw, director of government affairs at CAIR, said campaign organizers across the nation would work within communities to make sure Islamic community centers have the tools they need to register voters. According to the Pew Research Center, Muslims represent just 1 to 2 percent of the country’s population, but they tend to live in strategic places — swing states like Florida, Ohio and Virginia. “When the vote is close, then in fact, the Muslim vote in those swing states can play a significant role. They ... will be seen as a significant minority community,” Georgetown University Islamic studies professor John Esposito said. Trump has called for a temporary ban on Muslims entering the country and has praised the leadership of the late Saddam Hussein, who was deposed as Iraq's president. The campaign aimed at getting a million U.S. Muslims to register to vote will certainly play to the advantage of the Democratic candidate, Esposito said. A February 2016 survey of 2,000 Muslim American voters by CAIR showed that two-thirds of them supported the Democratic Party, with 15 percent to 18 percent voicing support for the Republican Party. CAIR notes that as of June 2016, there were 824,000 registered Muslim voters, and that more than 300,000 had registered since the 2012 presidential election. Rather than pulling Muslim votes — or even Latino votes — to the Republican Party, Esposito said, Trump is pushing them away. “A candidate might say, ‘These people don’t normally vote, or overwhelmingly, or significantly, for Republicans,' but a candidate might say, ‘I can get some policies that would attract them,’ but Trump has done just the opposite,” Esposito added. 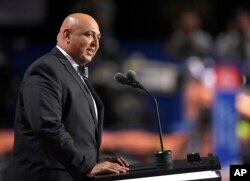 Sajid Tarar, founder of American Muslims for Trump, delivers the benediction at the conclusion of the second day of the Republican National Convention in Cleveland, July 19, 2016. At this week’s Republican National Convention, Sajid Tarar, the founder and leader of a group called Muslims for Trump, told VOA that once people within the community learn more about Republican policies, they will connect them to personal safety, which might increase the number of Muslim Americans who would consider voting for the Republican candidate. “The safety of America is the No. 1 priority for Donald Trump, and as a Muslim American, it’s my No. 1 priority as well,” Tarar told VOA this month. Tarar said some Muslims are attracted to the Republican Party because of what they see as family values and support for family unity. But only 11 percent of those surveyed in February said they supported Trump. “We are fundamentally Republicans because we come from conservative countries with conservative values,” Tarar said. McCaw and other members of CAIR also attended the Republican National Convention and said they had “one clear” message to deliver. “That was for the Republican Party to make itself a welcoming place for American Muslims and to stop the practice of political Islamophobia,” he said.